Vientiane was our decompression stop. 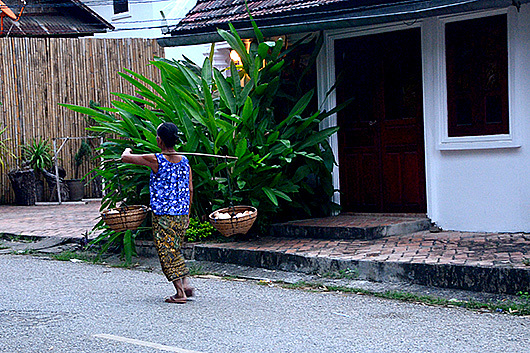 With minds and bodies suitably attuned to the calm that forms the core of Lao lifestyle, we do nothing on our first evening in Luang Prabang, save for a brief foray into the night market, following a fabulous complimentary meal at our hotel. 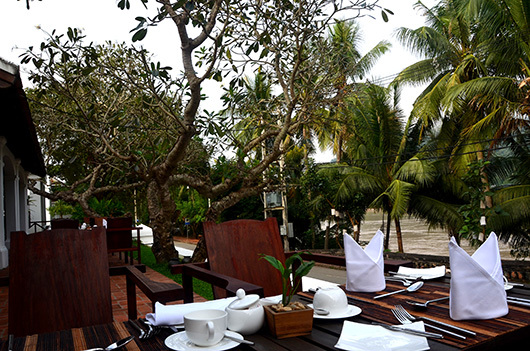 We have to drag ourselves away from breakfast overlooking the Mekong the next morning. We have just three days, and we can’t possibly sit around staring at that soporific view all day, however tempting its hypnotic spell. Outside, the long narrow streets lined with perfectly preserved colonial buildings, and peppered with the sweeping gables of temple roofs at every corner, were exactly as we had pictured them. UNESCO’s strict guidelines helping preserve much of the authentic character. The serenity, the ornate gilded woodwork and the profusion of exquisite golden Buddhas in the temples aside, it is the distinctly rural ambience that touched our hearts. As well as the smiling faces of its people, the gentle nod and coming together of the hands in a nop, the lilting Sabaidee. 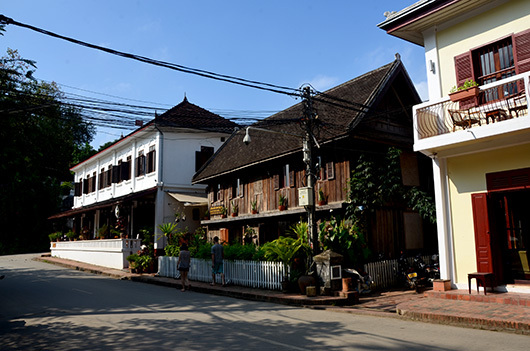 We start at Wat Xieng Thong, that perfect example of the Luang Prabang architectural style. 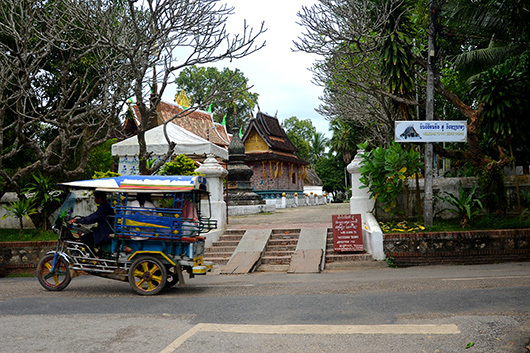 Later we cut across to the Nam Khan and follow its banks all the way to Wat Visoun, the oldest temple in town, and then, circumambulating Mount Phou Si, to Sisavangvong street. This is the main drag of the old town and where all tourists congregate. Where the extent of commercialization is most explicit, in its souvenir shops, restaurants, pubs and travel companies. It takes about an hour, in true Lao fashion, to be served tall glasses of iced coffee, sandwiches and cheesecake at the Scandinavian bakery. But who’s in a hurry? The rest of the day is spent napping and soaking up the quiet. And yes….a lip-smacking dinner at Tamnak Lao. Who would have thought fresh river fish stewed with aubergine could taste so wonderful? On the way to dinner earlier that evening, we are lured into the exquisite Wat Mai Suwannaphumaham, by the faint sounds of rhythmic chanting. One of the monks opens the gate and beckon us in, reminding us not to use flash. 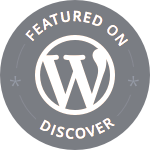 We sit on a bench near the door, listening to the comforting cadence of “Buddham Sharanam Gacchami…..”, while little children kick a soccer ball in the fading light outside. For some reason, the presence of those children, heightens our profound sense of well being. We catch up with the mighty Mekong on a long-tail boat to the Pak ou caves the next day, that we decide to share with an American couple. 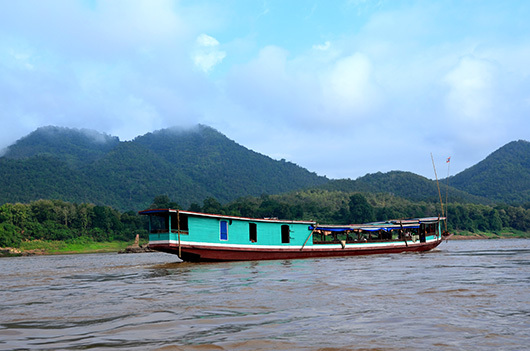 The long cruise lulls us further into Luang Prabang time, and the journey, rather than the destination, seems the more interesting. Later that afternoon, after lunch at 3 Nagas – whose famous pumpkin and coconut crème brûlée is not yet on the menu since it is early tourist season yet – we walk up to the palace museum to check out the diminutive Phra Bang, the sacred statue that gives the city its ‘golden’ name. 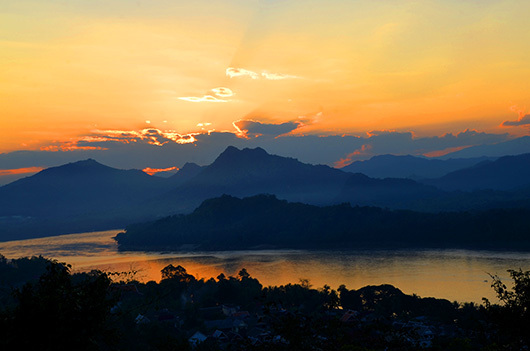 R who is nursing a sore back, decides to return to the hotel, while I climb the 355 steps to mount Phou si, to join a very amiable crowd awaiting the spectacle of sunset over karst peaks. Dinner was at Tamarind, where great food was overshadowed by iffy service. In the early grey light of our last morning, we witness the alms giving ceremony right at our doorstep, and with none of the attendant tourist circus that we had read about. 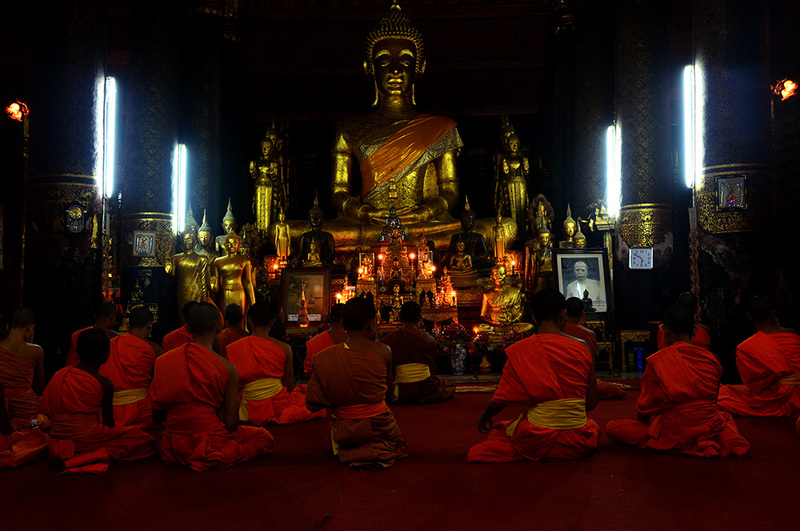 Steps away from Wat Xieng Thong, the silence, the inherent devotion, is deeply moving. Should tourists take part? I don’t think so. Not until they learn the true meaning of this beautiful ritual signifying humility and detachment from material things, and certainly not as a photo op. A century on, its allure seems intact. But the threat to its slumber and its religious heritage is real.